If any of you are like me and are inept at mating, let alone mating on a deadline you might have missed the cuffing season rapture. One second, all your friends are single and living it up and next second, everyone’s instagramming pictures of convos with some mystery person and kissy facing emojis and hashtag “him”ing everywhere. You, however, might have made it to the 11 floor on 100 floors but in the cuffing game you’re on the first floor scratching your head while the rest of the world is competing on 99th floor. I’d like to tell you your time is coming, but I don’t even believe that for myself. I just have my 1.5 degrees and world of potential to keep myself warm at night. However, being the eternal silver lining discoverer that I am, I have found some bright sides for you to consider. So sit back, relax, and read cuz you really ain’t got nothing to do anyways. 1. You have full control of the temperature at all times. Nobody to fight with over the apartment air conditioner being on in January. No playing dodge the human furnace at night because it’s super hot and he still trying to cuddle. You can be as hot or cold as you want to be. 2. You finally get to use that Snuggie your family member bought you. Do I even need to explain this one? Snuggies are awesome! Except the whole back being open part. If they had Snuggies with a back tie? Clutch. 3. You don’t have to use all of your unlimited minutes or texts. I mean save some for a, never mind I can’t even BS the inactivity on the phones. Instagram messages with your mom or something. 4. Heated blankets are for one, not two. Who really wants to be under a heated blanket with another hot person? Maybe I just have issues with body heat. Idk. 5. No one eating up your food, running up your water or electricity but you. Self explanatory. 6. You don’t have to shave your legs. Nobody rubbing on them means leg hair no care. 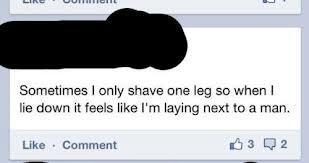 I personally don’t grow leg hair but I heard shaving can be inconvenient somehow. 7. No objections to watching your terrible sappy colored love movies on Netflix. I enjoy watching my terrible movies without objection. I don’t know about you.